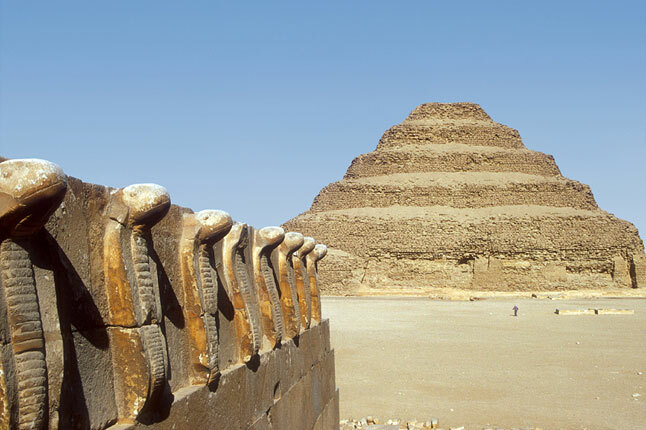 Modern-day Egyptologists will tell you the Step Pyramid at Saqqara is the oldest known stone pyramid in the world. But most are unaware of the incredible significance this ancient complex once held for history’s most advanced healers. These are the same healers who “wrote the book” for all mystery school teachings spread throughout the Temples of Egypt. Last week I returned from leading a small group to this sacred site, my second visit there in this lifetime, but no less a powerful remembering experience. For me, it will always have a feeling of coming home. 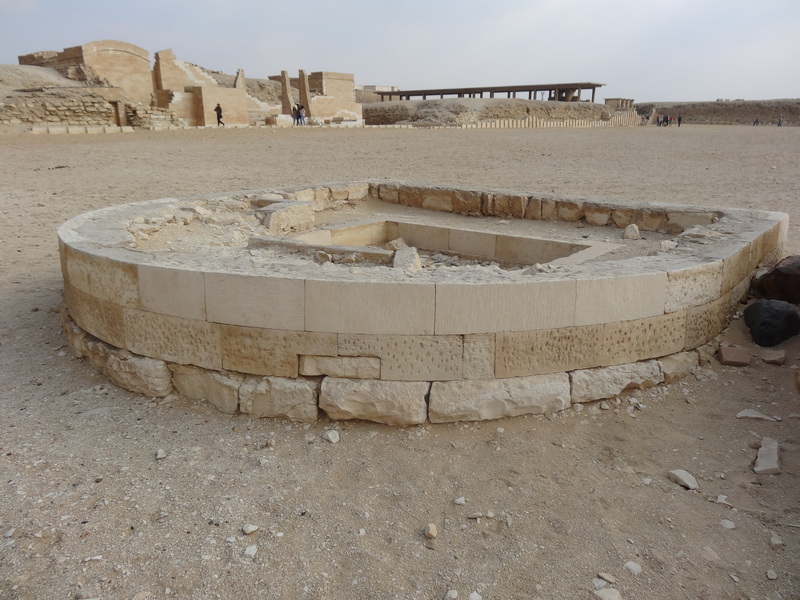 Saqqara’s history goes back much further than the Third Dynasty when King Djoser had his royal architect, Imhotep, design the now famous Step Pyramid. The Saqqara area was where many of the elders, especially the priests of the Cosmic Order of Melchizedek, came to preserve the ancient knowledge after the third and final upheaval of Atlantis. The practices of the original Temple Beautiful (which the sleeping prophet Edgar Cayce spoke about) were carried forward from Atlantis to Saqqara where they flourished under the guidance of the spiritual and cosmic brotherhood. While there were many Temple Beautifuls in each community, the main Temple Beautiful was once housed inside the Step Pyramid of Djoser which has more than 5,700 meters of shafts, tunnels, chambers and galleries. Much like the Great Pyramid and the Sphinx, it too has undiscovered underground passageways. Many early Egyptian pharaohs, who maintained peaceful Atlantean principles taught by the elders, were eventually, over time, replaced by a more conquering, military-based succession of Kings. These military kings secured their power by disposing of those they thought had access to more celestial and earthly power than them. Consequently, many of the Temple Beautiful priests were assassinated. Others fled hoping to preserve the knowledge of the forces of nature with them. With the priests gone, the original Temple Beautiful would later become a tomb. But I’m getting ahead of myself in this story. 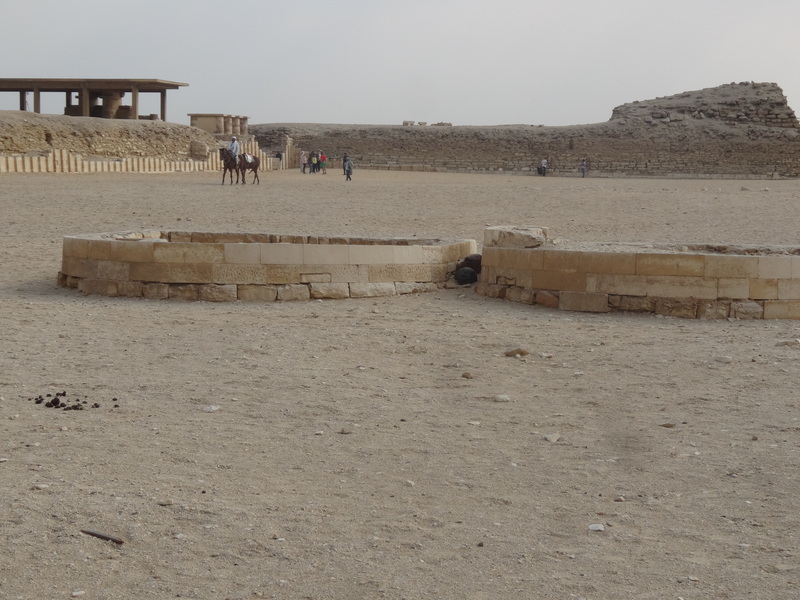 The Saqqara complex was once surrounded by a high privacy wall that naturally kept out those who were not invited in and/or those who did not vibrate at the higher frequency it was tuned to. This frequency, which was tuned to love and harmony, versus fear and destruction, was regularly maintained by both initiates and priests by standing within the niches of the inside walls and using harmonic toning to set up a desired frequency field effect. My group set up their own tuning chain in the remaining part of the wall, connecting to their ancient counterparts (see pic). 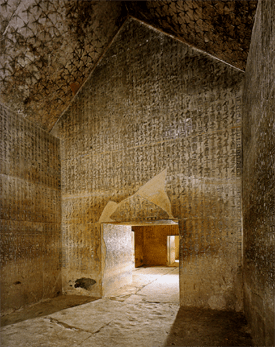 On the east side of the Saqqara complex, located within the great outer walls, is a series of chambers once used as a teaching school for the vibrational sciences. This series of buildings housed sound healing rooms. Multiple “cone-like racks” were seen along many of the inner wall rooms. 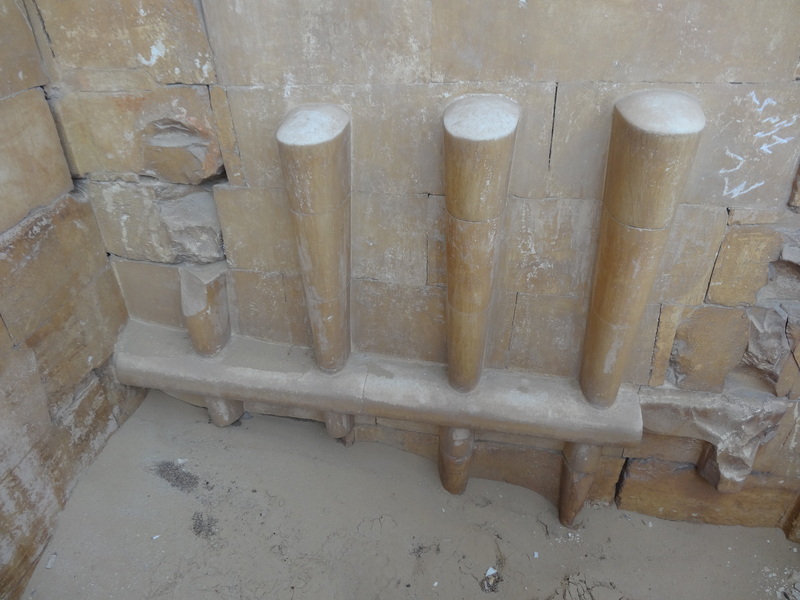 These strange-looking devices, which you don’t see anywhere else in Egyptian temples, were used in setting resonant frequencies for the purpose of healing the etheric body. Healing with sound, color, light and music was integral to the ancient process of re-harmonizing the body back to a state of total health. This process aided in resetting the person’s own unique frequency signature (much like doing a computer restore point). Health was equated with being in tune with one’s true soul path. 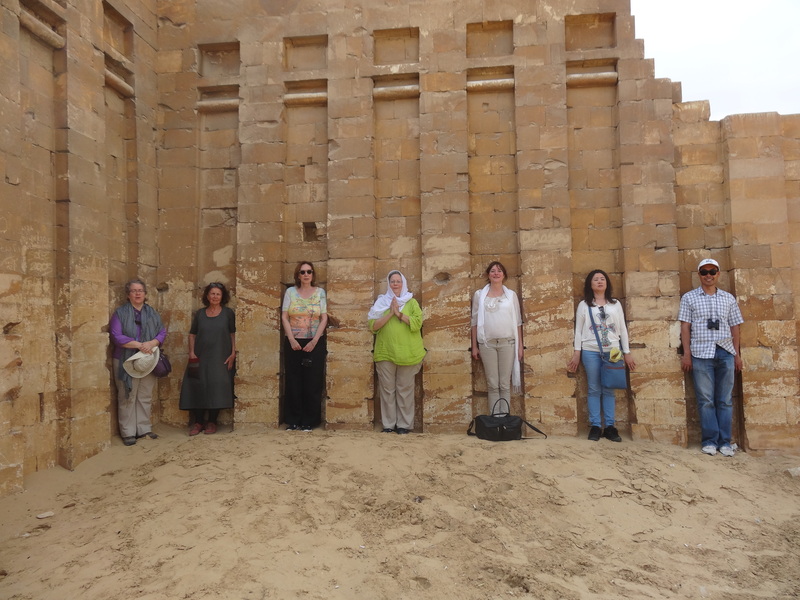 The body was seen as an earthly vehicle which housed the soul and was treated, “like God’s Holy Temple.” Living a life in resonance and loving service to others was what the tenets of Saqqara priesthood were all about. The cosmic priests of the Order of Melchizedek were not only highly adept in harmonic sound healing, but also possessed the ability to transmute matter into spiritual light energy (known today as tachyon energy). This is what Jesus (a Mystery School initiate himself) spoke about when he referred to “God is Light.” Through this process one could perform such things as Jesus did in turning water to wine and resurrection of one’s physical body into pure light. Pure light energy could then be changed into anything—even silver or gold. This was the basis of alchemy. Transmutation was the key to the ascension/resurrection process. Taking this step opened one to the understanding of the Universe. This is why the Ancient Egyptians were obsessed with the cosmos, the stars, and traveling through the underworld to other realms. They were trying to tell us what they knew, while not exactly giving us the step-by-step instructions on how to accomplish the physics of it. In the transmutation process one’s body could move beyond the limitations of earthly existence and travel freely throughout the dimensions where even the future could be seen. To learn transmutation was in essence receiving the Keys to the Cosmos. Is it any wonder the priests who learned this knowledge from their Atlantean brotherhood, who probably learned it from Star Visitors to this planet, were something the latter Kings would try to vanquish? 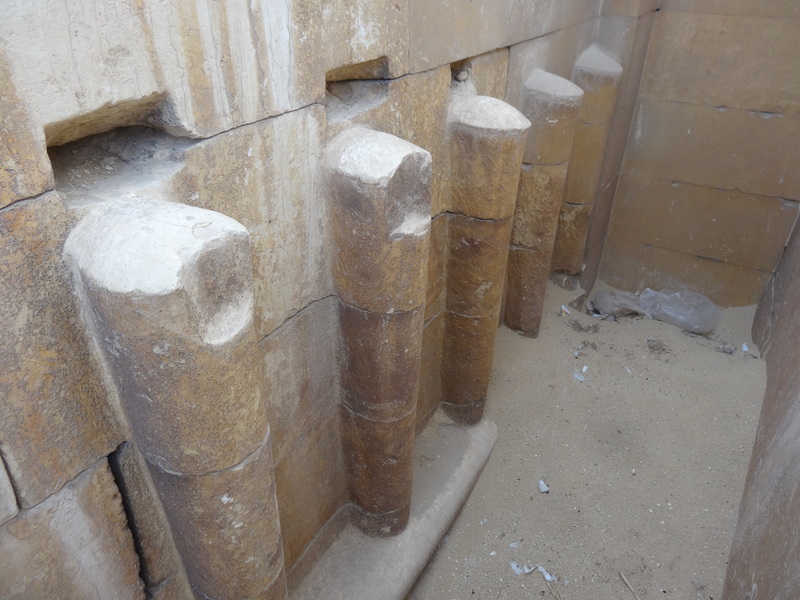 While the ability to transmute one’s earthly body was the penultimate to aspire towards, the Saqqara priests knew more about harnessing the forces of nature than we do today—especially in building. They employed the use of high frequency sound in precision stone cutting. Today’s expert engineers in masonary sheepishly admit we have nothing nearly as comparable as the ancients had. The Rods of Ptah were “U-shaped” at the bottom, resembling resonant tuning forks that could be struck in ways to create electromagnetic effects. At the top were the symbols of the Ankh (the symbol of life) and the Djed Pillar (a symbol for the spine of the God Osiris and rising energy). These powerful symbols could only be used by the higher priests or a Pharaoh (who had also undergone initiation). They could only be used within the right mindset of the operator or the power could be destructive. You will not find these instruments in museums anywhere today. The priests of the ancient mystery schools destroyed them to keep them out of the hands of those who would abuse the power they could harness, much like the Ark of the Covenant was later secreted away for safety and protection. Although later Pharaohs used these power symbols in depictions of themselves, many were no longer privy to the full extent of this mystery school ability. Today, the representation of these symbols are seen as kingly sceptres, their true meaning entirely lost. Before one could enter the Temple Beautiful, and be initiated into the knowledge of cosmic alchemy, one had to first pass tests of one’s true spirit in the Temple of Sacrifice. This Temple was where one demonstrated they had mastered the ability to let go of anything fearful, ego-based and self-serving. The ancients used the auric field of the initiate to determine this. This test was more accurate than today’s lie detectors. One simply could not fake one’s auric color field. If the initiate maintained this field throughout all their tests, then and only then were they allowed entrance to the Temple Beautiful. The Temple of Sacrifice, which was mostly underground, is now long gone. Only two large “B” like structures marking the places where the initiates entered and exited, can be seen in the courtyard. Egyptologists today say it was used to race horse carts around. I guess, nothing else made sense to them due to the odd shape and placement. So far, they have not attempted to dig any deeper to see what might be found underneath this structure. Perhaps, time will tell. For centuries, much of this ancient knowledge has been buried and forgotten. Today, during this great evolutionary time in our 26,000 year planetary cycle, many souls from this ancient time have once again returned. They are being re-awakened. They are the healers and helpers of the world. They are here to hold the frequency of love and peace, so man will not destroy himself through fear and hate. Instead, man must find his way back to his true Source and God’s Divine Light. In the spirit of our ancient Saqqara brotherhood, we should find time each day to sit in quiet meditation, to tone, to pray, to send out loving and healing thoughts to all our brothers, both here on this planet and throughout the Universe. It’s time to put aside our differences, embrace our true oneness, and come together to make peace work. Namaste to all.